A disaster can easily strike at any time, leaving you without an energy supply for heat, light and cooking. Here are some things you should have on hand ahead of time that will ensure you are prepared for any situation that arises. If you are unable to burn firewood, you may need to rely on an alternate fuel instead. As such, you should ensure you have kerosene heaters along with a few day’s supply of fuel on hand at all times. Never use kerosene heaters indoors without ensuring there is adequate ventilation, as this increases your risk of fire and also makes it more likely that you will be overcome by fumes. If you must rely on kerosene, be sure to have some battery-operated carbon monoxide detectors on hand just in case. 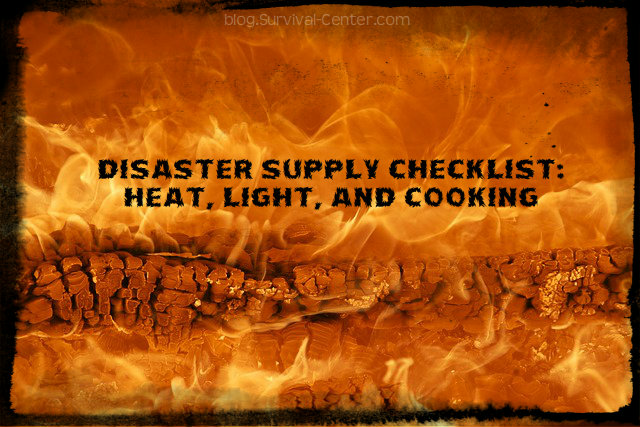 Don’t forget these essentials when making your heat, light and cooking checklist. You’ll be in a much better mood to survive a disaster if you are well fed, which is why you should have a stove that does not require electricity in order to operate. Examples would be a gas or charcoal grill or a Sterno stove. You could even decide to cook over an open campfire, in which case a fire grate and cast iron cookware are nice items to have. In any case, you should check your equipment periodically to ensure it is in good working order in case you need to rely on it later. It can also be a good idea to have some easy-to-prepare recipes handy so that you can whip up a tasty meal whenever you need to. By keeping these heat, light and cooking supplies on hand, you can ensure you are ready for any power outage that might come your way. You’ll also be able to survive more comfortably, since staying warm and well fed will not be a problem. This entry was posted in Cold Weather Survival, Emergency Preparedness, Emergency Survival, Prepping and tagged disaster supply checklist on March 21, 2014 by David Adams.